A rally by Hungary's anti-Semitic Jobbik party has gathered hundreds of nationalists in downtown Budapest, despite government efforts to ban it due to its nature. The protest comes amid a recent rise in anti-Semitic incidents in Hungary. Nearly 1,000 people attended Saturday’s demonstration that was initially banned by police as it coincided with a meeting of the World Jewish Congress (WJC) in Budapest. A Hungarian court overturned the ban Friday, saying that police failed to ban the protest within a 48-hour limit and also did not provide evidence for why they wanted to stop the protest. 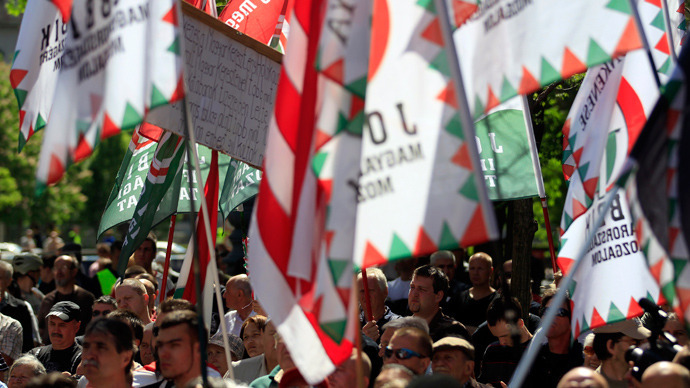 The event billed as a commemoration of “the victims of Bolshevism and Zionism” was orchestrated radical nationalist Jobbik party, currently the third-biggest party in the parliament. Protesters, many in uniforms and carrying flags used in Hungary’s Nazi-regime, have been “praying” for the end of Zionism and calling for lawmakers or public servants holding dual Hungarian-Israeli citizenship to resign. Speaking at the protest, Jobbik leader Gabor Vona made provocative comments, saying that Jews should ask for forgiveness for the crimes committed under the ruling of Communist Jewish leaders like Bela Kun or Matyas Rakosi. The rally ended after almost two hours and the protesters dispersed without incident. The demonstration took place just a day before three-day World Jewish Congress meeting, this time encouraged by the recent wave of anti-Semitic incidents, kicks off in the city Sunday. “The number of anti-Semitic or anti-Roma [Gypsy] statements increased dramatically in recent years, and some of them have come from senior members of the prime minister’s party or his government,” WJC President Ronald Lauder wrote in recent newspaper opinion piece in April. Hungary’s anti-Semitic wave has expanded from comments regarding Jews and the vandalism of Jewish symbols, escalating to the point where the chief rabbi was assaulted by a number of anti-Semites in the middle of a crowded street. 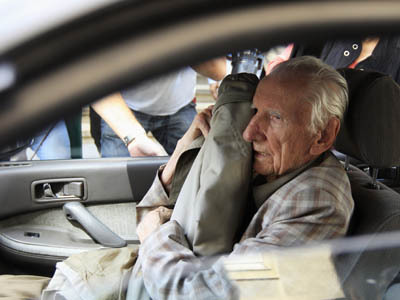 The incident prompted official condemnation from the government. It is expected that PM Orban will address the opening of WJC. 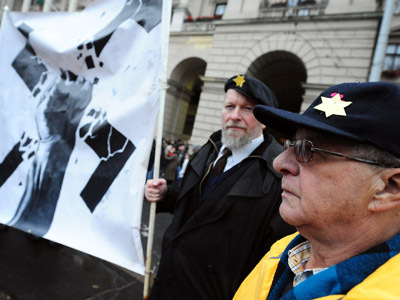 The rise of right-wing extremism in the country has drawn attention of Jewish organizations in recent time, especially after a January 2012 poll revealed that Hungary is one of ten European countries whose anti-Semitic attitude remains high. The level had risen to 63 per cent from 47 per cent in 2009. Center-right Hungarian government has been repeatedly accused of presiding over growing anti-Semitism. The WJC, which normally holds its worldwide assembly in Jerusalem, decided to hold its annual session in Budapest to show solidarity with Hungarian Jews after a series of anti-Semitic incidents and to focus attention on the rise of right-wing extremism. There are up to 100,000 (estimates range from 50,000 to 100,000) Jews among the 10 million population of Hungary, where Jewish community is said to be one of the biggest in Europe.